Firefighters responded to a fire at the Archer Daniels Midland plant over the weekend after a report of smoldering material in a silo storage bin. Unfortunately, despite efforts to stabilize the scene, an explosion occurred killing one firefighter and critically injuring another. According to the fire chief, an investigation is underway and is “expected to take a long time” to determine what happened. Silo fires and explosions can sometimes be traced back to unloading equipment or even spontaneous ignition. As they try to pinpoint what caused Saturday’s fire and the subsequent explosion, investigators will likely look at unloading equipment for electrical problems, bearings that may have overheated, or slipping belts that may have caused dry materials or dust to ignite. Investigators may also look for evidence of spontaneous ignition, which can sometimes occur when materials are poorly distributed and subsequently come into contact with air. According to the National Ag Safety Database (NASD), efforts to prevent silo fires include regular inspection and repair of any damage to the silo structure to prevent air seeping into the silage, a material that should have proper moisture and be compactly distributed to avoid ignition. Equally important are regular inspections and repair of the unloader system to ensure all working parts are in good condition and that there are no electrical issues. 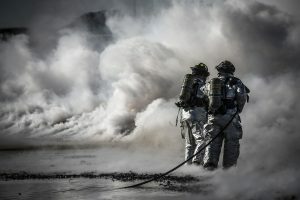 Combustible dust, equipment and machinery issues, and electrical hazards are among the top five causes of industrial fires and explosions across all industries. According to the National Fire Protection Association (NFPA) an average of 37,000 fires occur at industrial and manufacturing properties annually resulting in property damage, injuries and sometimes death. Because many employees and managers are unaware of the risks they face every day, it is important to provide regular training, inspect and maintain equipment, perform general housekeeping to reduce hazards, and ensure that employees follow policies and procedures to prevent accidents from occurring. McDonald, Woodward & Carlson PC has taken many cases to trial over the last 70 years. We strive to obtain justice and fair compensation for our clients and their families. Call our Iowa and Illinois workers’ compensation insurance claim and wrongful death attorneys at 563-355-6478 for help and answers to your questions.